When Texas Attorney General Ken Paxton backed ExxonMobil in a now-settled legal dustup over a subpoena from the U.S. Virgin Islands demanding climate-related documents, it was natural to assume that the courtroom allies were also partners in a broader effort to deny global warming and derail action. Certainly the biggest crude-oil and natural-gas producing state and the biggest U.S. oil company, based in the Dallas suburb of Irving, must share views over whether fossil fuels are warming the planet and whether it’s time to do something about it. They don’t. Texas and ExxonMobil agreed in court that the U.S. Virgin Islands’ subpoena of company records, part of a multi-state investigation of the adequacy of the company’s climate-risk disclosures to shareholders, was improper. But that was about all they publicly agree on regarding global warming. On the bigger stage of climate science and global responses, the oil giant has rejected many Texas politicians’ favorite talking points. In fact, if Texas just copied its global warming position straight from ExxonMobil’s public statements, it might have a much more proactive – perhaps even tilting toward progressive – climate policy. Many scientists believe that certain human activities impact the climate. Others dispute the extent to which any activity has a particular level of influence on the climate, which is why this matter needs to continue to be investigated. In other words, Abbott called manmade global warming an unproven theory, with as much scientific evidence against it as for it, so pollution-reducing action to minimize it is still premature. Maybe someday, after an indeterminate amount of additional research, but not now. The risk of climate change is clear and the risk warrants action. Increasing carbon emissions in the atmosphere are having a warming effect. There is a broad scientific and policy consensus that action must be taken to further quantify and assess the risks. Climate reports from the U.N. – which the Obama administration consistently embraces – are designed to provide scientific cover for a preordained policy. This is not good science. But in a 2014 voluntary report to CDP, a London-based nonprofit formerly known as the Carbon Disclosure Project, ExxonMobil described climate change from human causes as a global social crisis, not a political ruse. The company said human society faces two urgent energy challenges. The first, it said, is providing energy to raise living standards. The second challenge is to address the potential societal and environmental risks posed by rising greenhouse gas (GHG) emissions. Managing GHG emissions and energy challenges requires action by individuals, companies, and governments. … Climate change presents serious risks that are worthy of cost-effective action by individuals, companies, and policymakers. No one should use such statements to confuse ExxonMobil with an environmental group. ExxonMobil plans to keep selling products that produce climate-warming carbon, chairman and CEO Rex W. Tillerson reminded the world in May. The company won’t embrace the swift abandonment and replacement of fossil fuels that many scientists believe is needed to limit damaging increases in global average temperatures. ExxonMobil’s critics say its public persona as a climate-action advocate came only after decades of backstage efforts to sow doubt and delay. The attorneys general of New York and some other states contend that ExxonMobil for years hid or downplayed its knowledge of climate risks from shareholders and investors. The company denies any concealment, says it’s been a model of corporate transparency and calls the probes an attack on free speech. ExxonMobil says it’s reducing carbon dioxide emissions by scrubbing its internal operations and producing natural gas as a lower-carbon alternate to oil and coal. It’s also researching carbon capture and storage technology that, theoretically at least, would someday strip CO2 emissions from fossil fuels. There are plenty of wider policy options on the global table, too, but last month, the House of Representatives gave one of them that seems to have growing support, a tax on carbon emissions, a resounding no. By a largely party-line vote of 237-163, House members endorsed a resolution saying that a carbon tax would hurt the economy and energy supplies, essentially shutting down any consideration of it. All 25 Texas Republicans and one Texas Democrat, Rep. Henry Cuellar of Laredo, backed the resolution. Of the eight other Texas Democrats who voted, all opposed it. So a carbon tax would be bad for the economy and energy supplies? Don’t tell that to Texas’ most globally important corporation, which happens to be in the energy business. 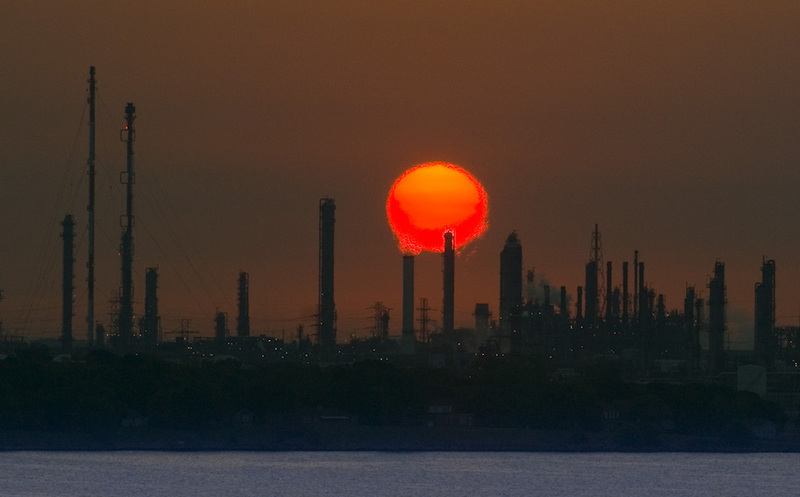 ExxonMobil wants a carbon tax and is getting more assertive about it. Well, maybe. And maybe an oil company’s climate statements are ahead of its home state’s positions. Just don’t tell that to Texas. Image credit: Louis Vest / Flickr. Cropped slightly and used under a Creative Commons license.